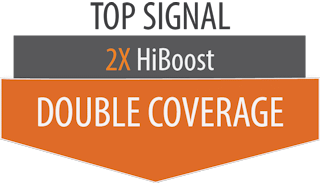 Top Signal’s 2X HiBoost cell signal booster systems provide maximum improved cell signal coverage in your home. By adding larger, more robust coax cable and upgraded outdoor antennas, these 2X systems double the coverage area of standard HiBoost products. If you have any questions about the performance, installation, or use of our Top Signal 2X HiBoost kits, please contact us—we’ll be happy to answer your questions!